This home provides an ideal quiet working atmosphere for those on business. Located near both the Colorado and the Yale stations of the Southeast Lightrail, you have fast and easy access to downtown and the Denver Tech Center. Many shopping and fitness conveniences are a short walk away, and it's even closer to tennis and swimming at nearby Eisenhower Park. Please feel free to contact us with questions about length of stay. The charm of this early fifties vintage home, coupled with it's updated conveniences, give it an irresistible appeal. Classic and understated touches throughout the home remind you of the natural beauty that is so abundant outside your door. 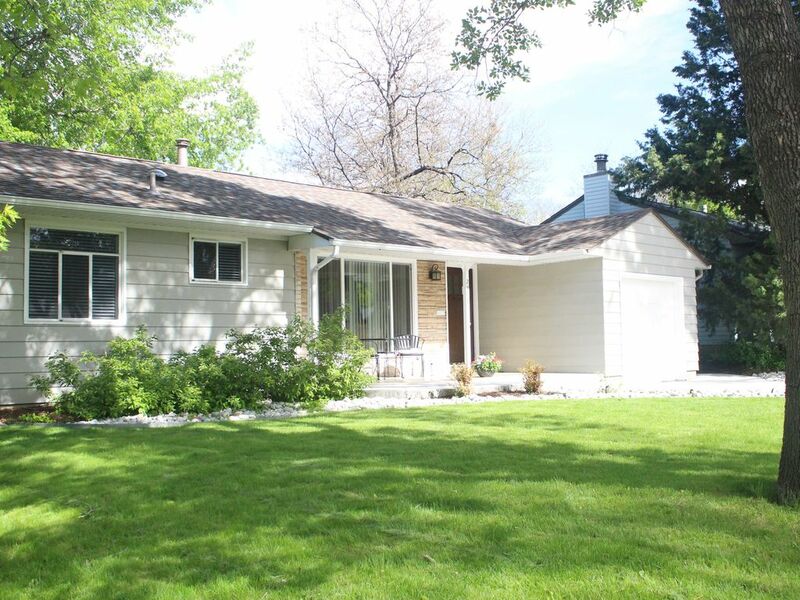 The home sits on a quiet, tree-lined neighborhood street, just 10 houses north of a beautiful public golf course. The large, fenced backyard is ideal for cookouts and child's play. The bedrooms are outfitted with high-quality linens and plush pillows. Each has a dresser and a closet for ample storage space. The kitchen is an efficient layout and equipped with all the conveniences you'd expect: a dishwasher, microwave, and gas stove. There are stainless steel pots and pans, dishes and flatware for eight. The living room boasts a large LCD TV with cable and On-Demand, a stereo system and a DVD player. There are a few DVDs in the home that you are welcome to view, or you can choose one of the hundreds on FREE On-Demand movies that are available to watch. Our WIFi works great on the porch or in the backyard as well as in the house. There is also a full sized laundry room downstairs with a front loading washer and dryer. Should you need to press your clothes, the ironing board and iron are located there, along with supplies to run a load. When you are lured outside by Colorado's great weather, you'll find a gas grill and table and chairs in the backyard. Beyond that, the public golf course, tennis courts, walking and running trails through natural areas, a YMCA and 24 Hour Fitness are all so close you can leave the car in the garage. Back at your Colorado cottage, sit back and gaze at the dappled green of the old maple in the backyard while you enjoy Denver's cool summer evenings, or enjoy the colors of the fall when the air turns crisp. Your tranquility will be complete when you snuggle into those soft sheets and slip into restful sleep. In addition, we have a large furnished downstairs, perfect for games or play when the weather is inclement. Jeanette and Kathy, along with Kathy's husband, Brian purchased the Jackson House in 2008 in order to provide a cool retreat for Kathy and Brian's family, who are from the Phoenix area. Jeanette has lived in the Wellshire neighborhood for more than 30 years and she is a licensed acupuncturist. Kathy and Brian are high school teachers in Phoenix, which gives them some time in the summer to enjoy Denver. Because Jeanette has lived in this neighborhood for so many years, we knew it was a solid neighborhood. We liked Jackson House the moment we saw it. The location is ideal for active families and quiet vacationers. The proximity of local restaurants, conveniences, and access to downtown and the Tech Center via freeways and Light Rail makes the home's location particularly attractive. It is a functional floorplan, making wise use of the square footage. The great surprise was what a terrific neighborhood community it turned out to be. Brian and Kathy stay at the house each year and their children enjoy the fenced, grassy yard and the Legos in the basement, as well as the many children's books kept at the home. Kathy appreciates the easy-to-use kitchen and lush backyard for the children, while Brian doesn't get to enjoy the house. He only works on it. Large fenced backyard with natural play area for children. We had a wonderful family Thanksgiving here in Jeanette's delightful home away from home! We cooked our turkey dinner (thanks to Jeanette for loaning us a roasting pan and other supplies) and all the other dishes while relaxing together, and watching the parade and football games. There was plenty of room - 4 of us stayed here and 2 more and a baby joined us during the day. Everyone had their own bedroom (with very comfortable beds) and two good sized bathrooms with lots of supplies. The neighborhood is nice and quiet. We'd love to come back in the summer to be able to spend time in the big back yard and patio. Jeanette is a terrific host --- very responsive, helpful, flexible and thoughtful!! We hope to come back again sometime. Owner is friendly and responds quickly. Quiet neighborhood, comfortable home and great patio/ yard for family gathering and child's play. This home and property was a good fit for our family gathering and accommodated the 7 of us comfortably. We were traveling with our children and grandchildren to spend time with family and great grandparents in Denver. It was very helpful to have the play bed and highchair for our 10 month old grandson, that Jeannette provided. The toys, books and games were also much appreciated. Though the kitchen is small it was well set up for all the cooking we needed to do in hosting a family 90th birthday party for great grandpa. It is a bit short on cutlery however. We enjoyed our stay and would come again. Our family of 6 had such a great time in the house. The backyard was geared for kids and the back patio was a nice place to be. My kids had so much fun on the tire swing and the slide. The house was well-stocked and clean. We would definitely stay here again. Thank you! We were four guys in Colorado for an extended golfing weekend. The home was fine and exactly as listed. Kitchen was well stocked with all cooking utensils one might need. Nice backyard for kicking back after golf. Upstairs shower drains slow, is really our only minor complaint. Overall, we enjoyed the home. Thanks Jeanette. The YMCA and 24hour Fitness are walking distance from this home. I will meet you in person upon your arrival. Major Holidays and some three day weekends will have longer minimum stays. Please inquire.